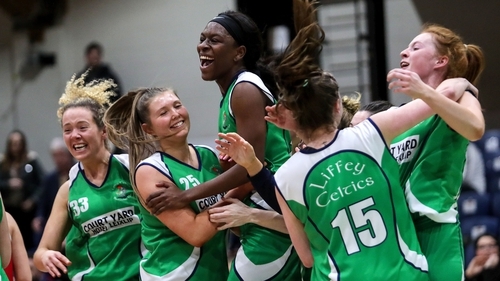 Courtyard Liffey Celtics won their twelfth successive Women’s Super League game, surviving a first-half scare to eventually defeat Singleton Supervalu Brunell 69-57, in what was a rematch of the Hula Hoops National Cup final. Needing a stellar fourth quarter in their previous game to win against Killester, Celtics trailed Brunell 36-32 at half-time. Brunell were obviously disappointed with their cup final loss and cut swathes through Celtics in the first and second quarters. By the end of the third quarter Celtics had reversed the scoreboard. Holding Brunell to eight points, Celtics scored 18 points to lead 50-44. When Celtics began to move through their gears in the third and fourth quarters, then they easily broke away. In turning a four-point half-time deficit into a 12-point victory, Courtyard Liffey Celtics’ Sorcha Tiernan remarked afterwards that their team is now a target: "We’re definitely getting the best game off everyone. "I think the last two games we just haven’t started great and they’ve both come at us in the first-half, and it’s taken us until half-time or the end of the third quarter to really get going. We need to definitely improve on that. "I think we are going to get our best game from everyone. Being unbeaten really puts a target on our backs but we’ve just got to take it one game at a time." Elsewhere in the league, Pyrobel Killester put in a dominating performance to secure an 87-54 victory over a determined IT Carlow Basketball. Jade Daly and Miah Spencer combined for 30 points for the Dublin side in the victory. Fr Mathews ran out 70-52 victors over Marble City Hawks in Cork on Saturday, with Grainne Dwyer dominant on all areas of the court for the hosts, bagging 22 points. Ambassador UCC Glanmire moved back into third place after they defeated a gutsy NUIG Mystics side, 80-58. Annaliese Murphy was the star of the show for the Cork side as she dictated the pace of the game and finished with 16 points. This loss continues Mystics search for a win in the Women’s Super League. DCU Mercy meanwhile scored a whopping 25 points in the second quarter, on their way to defeating Maxol WIT Wildcats 73-51 in DCU on Sunday. Wildcats led after the first but a fantastic display of both offence and defence, saw DCU hold Wildcats to just seven points in the second.